I did the Eclectic Reader Challenge in 2013 and thoroughly enjoyed it, so I'm back for another go! Shelleyrae at Book'd Out says - "the aim of The Eclectic Reader Challenge is to push you outside your comfort zone by reading up to 12 books during the year from 12 different categories." I will choose my books as I go along. 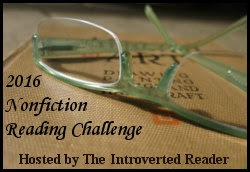 The Non-Fiction Challenge hosted by The Introverted Reader is a new one for me. It's a simple challenge - just read non-fiction books. :-) Memoir, travel, history - whatever! If it's non-fiction, it counts. I'm signing up for the Seeker level - read 11-15 non-fiction books this year. Again, I'll choose these books as I go along.